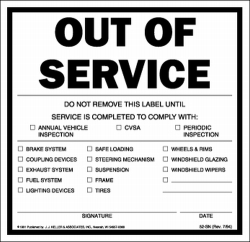 Out of Service Trailer Label Vinyl with Removable Adhesive 1323/52-SN identifies equipment placed "Out of Service". It has area for inspector's reason, signature, and date. Made of white vinyl with removable adhesive.